Cap 5-10 cm broad, convex, broadly convex in age, often with a low umbo; margin incurved, decurved to occasionally upturned in senescent specimens; surface dry, smooth, fibrillose to finely scaled in dry weather; color: white to ashy-grey; context white, thick, unchanging when bruised or in KOH; odor and taste mild. Gills close, free, pink, becoming blackish-brown at maturity. Stipe 3-6 cm long, 1-2 cm thick, tapering to a pointed base, stuffed; veil thin, membranous, fragile, either leaving remnants on the young cap margin or forming a median to superior, evanescent ring. Spores 5.5-8.0 x 3.5-5 µm, elliptical, smooth; spore print blackish-brown. Scattered or forming arcs and rings in grassy areas; fruiting from late summer in watered areas to early fall; often found with Leucoagaricus naucinus (Man on Horseback), Marasmius oreades (Fairy-Ring Mushroom), A. arvensis (Horse Mushroom) and A. californicus. Edible, of good flavor, but lacking the solid texture of an Agaricus bitorquis. The Meadow Mushroom is recognized by its grassland habit, short stature, stark, white cap, fragile, evanescent ring, pointed stipe base, and lack of staining reactions. 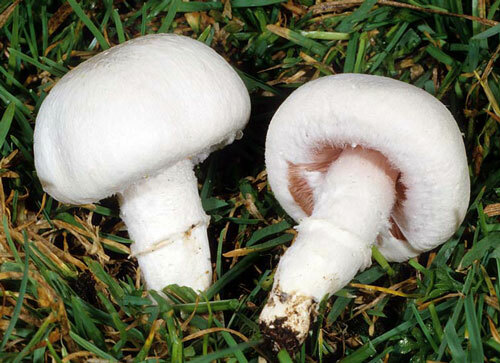 Agaricus californicus and A. xanthodermus are similar, also occur in grass, often more commonly, but are distinguished by their phenolic odor, yellowing when bruised (rapid in A. xanthodermus, faint and slow in A. californicus), different veil and stipe (see Comments under these species). A third grassland Agaricus, Agaricus arvensis (Horse Mushroom), bruises yellow slowly, has a sweet anise odor, a well developed veil with buff-colored patches on the lower surface, and a usually enlarged, not narrowed stipe base. Finally, Leucoagaricus naucinus, with which the Meadow Mushroom sometimes fruits, is a close look-alike, but can be distinguished by its white gills and spores.